these features develop a history, a legacy, and a heritage. sense of history, the architecture, and the routes we take through our day. Recently Figure Plant joined forces with the good folks over at the Northwood Apartments to create this 8′ x 20′ art piece for their lobby, celebrating Kenton’s History. Probably my largest wall art to date. It was a pleasure to work with Mary Hanlon of the Northwood and, as always, the Figure Plant team. 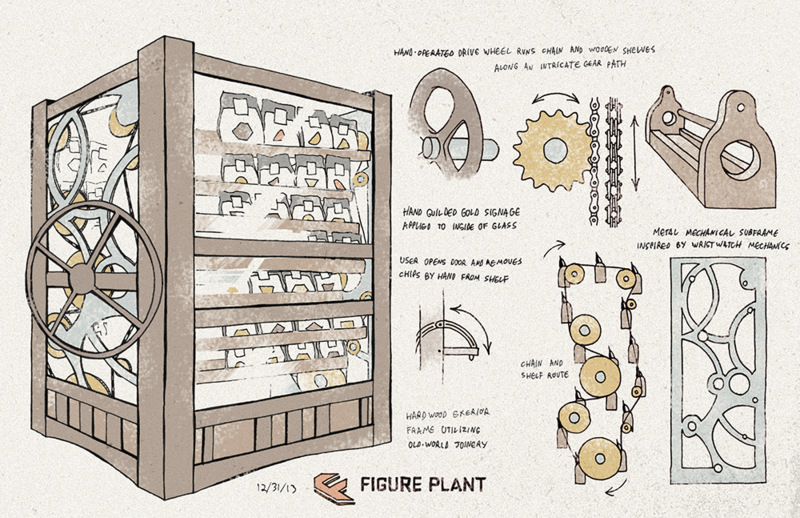 Here’s the project description on FigurePlant.com. 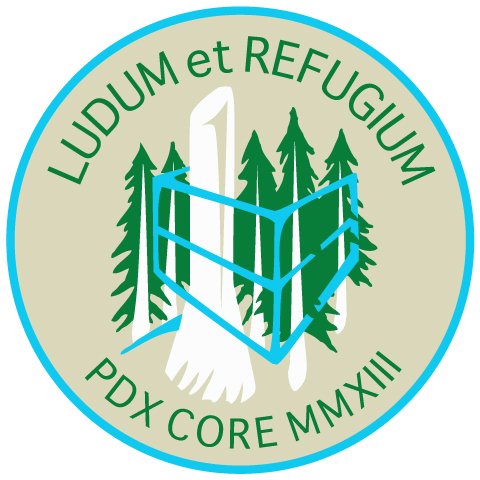 PDX History, and our neighbors and friends for telling the story of Kenton’s history. 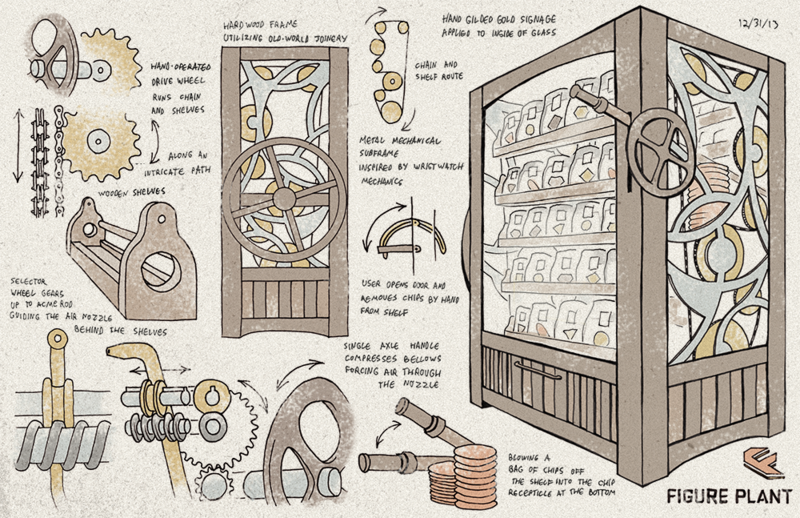 Two versions of an entirely mechanical vending machine; one which rotates the product in front of a hinged opening (above), and another which added a bellows-powered nozzle that could be aimed at a particular bag of chips and blow it down to the drawer below. It was super fun working with Figure Plant on the design, and then illustrating it in this style. 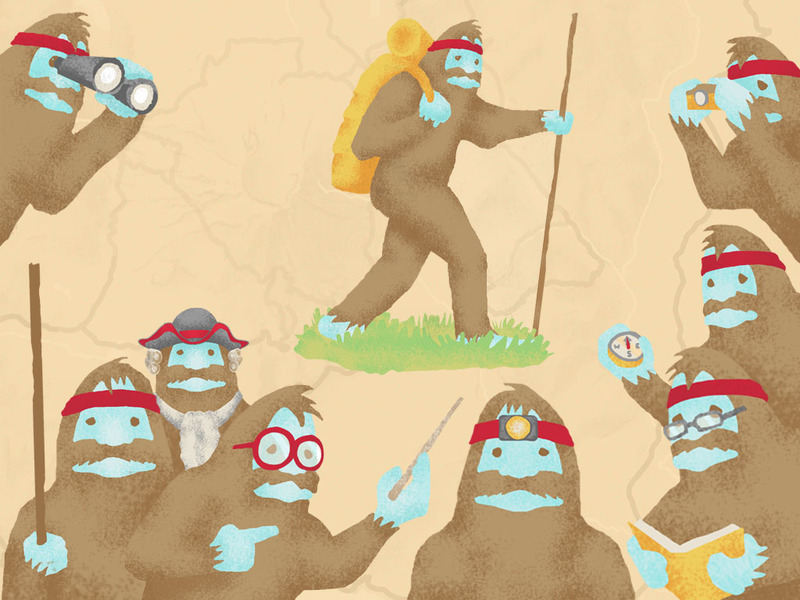 Art Director Kate Madden assigned a series of cartoon Sasquatch illustrations, a variety of more realistic animal illustrations, and a full page map of the Mount St. Helens area. It was a lot of fun to work in different styles, and then to see them come together in such an interesting and good looking feature! Squatch takes part in a variety of outdoor activities, navigating the area, observing and photgraphing the unique landscape, and teaching us about it’s history. Animals populate the map and field guide. 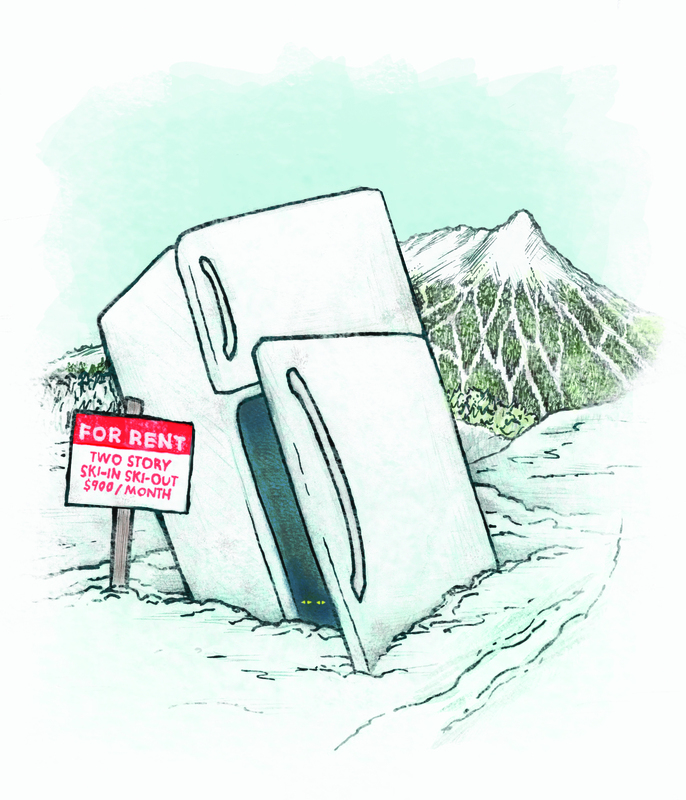 You can find out what these critters are up to here: Life Goes On: Mount St. Helen’s Flora and Fauna. 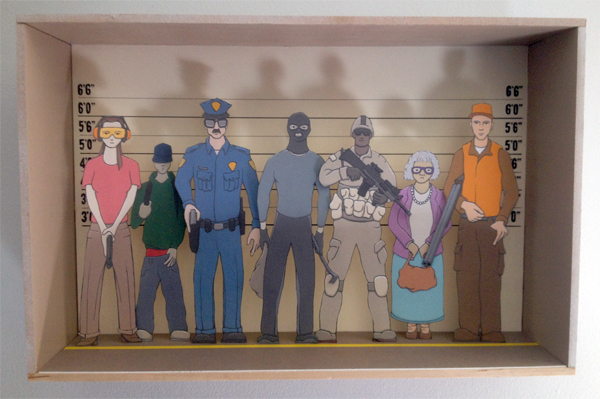 “Innocent Until Proven Guilty” mixed media shadow-box 18″ x 12″ x 6.” Created for the invitational exhibition “Gun Control” at 555 Nonprofit Gallery and Studios in Detroit, MI. Here’s a photo of the final piece before the glass and frame went on. I’ll show you some of the steps along the way. An early sketch before I’d decided on the line-up and redrew the character in the ski mask. After adding color to the characters, cutting them out, and inking all of their edges, I added some paper armature to the backs to keep them rigid. This also gave me more material to tie into for the paper ‘posts’ attaching them to the background. I pulled out an old trick for the numbers. I wanted them clean and well spaced, and done by hand. The matte board was too thick for a light box, so I printed out the numbers and made a carbon-transfer with pencil; shading in the reverse of the print and drawing the contours on to the board. 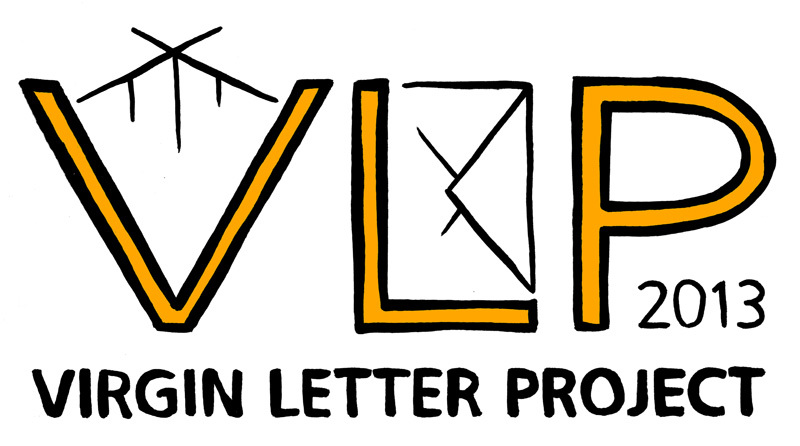 I made a digital version (from the hand-drawn characters) and there are prints for sale! Thanks for checking out my work, and check out what they’re up to at 555!